Welcome to Stop #18 of the February New Release Giveaway Hop! 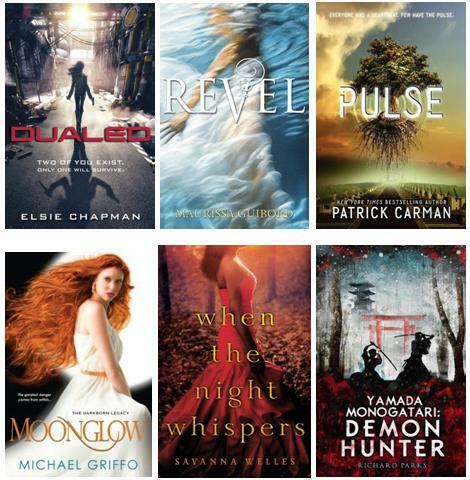 One lucky winner will win the book of your choice from one of the February New Releases pictured below. As always, I like to offer a mix of highly anticipated sequels as well as new debuts or stand-alones. I hope there is something here for everyone! The giveaway will end on Friday, March 1st at 12:00 AM, CST. Edge of Dawn by Lara Adrian. Unravel Me by Tahereh Mafi, which I've already read and loved! I'm also excited to start Breaking Point by Kristen Simmons. Divergent or Unravel Me. Hard to pick which one. I can't wait to read House Rules. Oh, Scarlet is would def. be my most anticipated. I'm most looking forward to Scarlet. Thanks for the giveaway! I'm really looking forward to Pivot Point and Fuse. Thank you for the giveaway! Sever and Mind Games. Thanks for the giveaway! Really forward to Dualed, House Rules, and Fuse! I'm looking forward to Unravel Me! I'm looking foward to Pivot Point! I´m looking forward to Unravel Me! Thank you for the giveaway. Sever. Thanks for the giveaway! I don't have just one unfortunately for my budget. From your list I'm looking forward to Scarlet and Fragments. I'm really looking forward to The Indigo Spell. Thanks for the giveaway. Houses Rules and Lover At Last!! I'm looking forward to The lives We Lost. Dance of Shadows or Pivot Point! The Lives We Lost 0r Unravel Me! There are two books that I am very interested in - Perfecr Scoundrels and The Indigo Spell. I can't wait to read How to Lead a Life of Crime and Pivot Point! 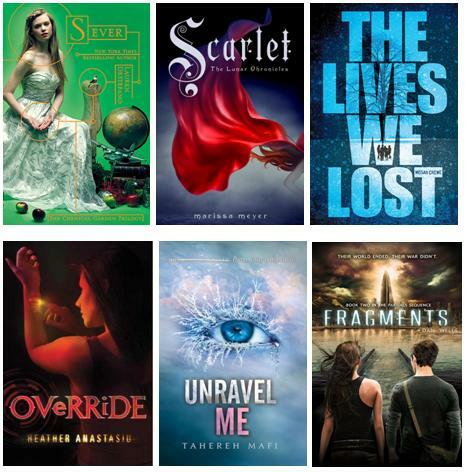 I can't wait to read Scarlet!!! I'm looking forward to a lot of Feb. books. Maybe Mind Games. The Indigo Spell and House Rules. I'm looking forward to The Damnation Affair by Lilith Saintcrow and Black City by Christina Henry. I'm really looking forward to Fragments. I'm looking forward to Unravel Me. Thanks for the giveaway! There are several that I'm excited about, but the one I'm probably most excited about is Etiquette & Espionage! Dualed and Pivot Point! Thanks for the giveaway!! I want to read Trinkets by Kirsten Smith! Hmm...how about SEVER by Lauren DeStefano? LOVE that series....can't wait to see what happens! I am looking to reading Scarlet. 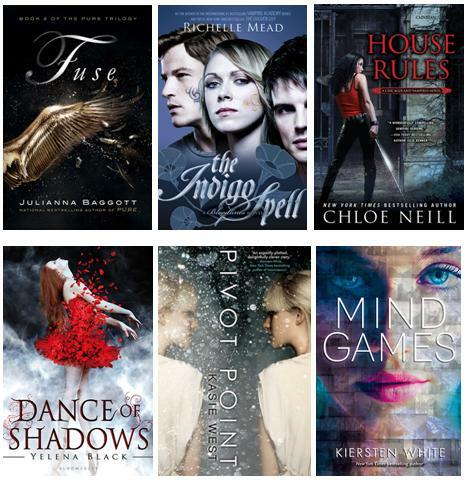 I'm looking forward to Fragments, The Gathering Dark, Pivot Point, Etiquette & Espionage and Dance of Shadows. Thanks for being a part of this sweet hop!! There are TONS that I am looking forward to, but one that I am getting more and more excited and anxious to read is Pivot Point. I am so very much looking forward to reading this book and staring at the cover in person. I'm excited to read Pivot Point! Thanks! Edge of Dawn and Rush. Thanks! UNRAVEL ME AND PIVOT POINT! Dance of Shadows looks pretty cool. Thanks for the giveaway. Unravel me, Mind games and Scarlet! I'm curious about Sever, Scarlet and Pivot point the most! Edge of Dawn and The Indigo Spell are both what I'm waiting for. You only have The Indigo Spell on your list. Perfect Scoundrels and City of a Thousand Dolls! I'm looking forward to Pivot Point and Scarlet. Thank you for the giveaway! It was The Indigo Spell by Richelle Mead but I couldn't wait to see if I won it in a giveaway, I had to run to the store and get it the day it came out! Reading it now and I have to say I'm glad I didn't wait it's Amazing! Probably Pivot Point! THanks for the great giveaway! I can’t wait to read Scarlet by Marissa Meyer and Etiquette & Espionage by Gail Carriger! Thanks for this amazing giveaway - I would love to win! Pivot Point and Unravel Me! Thanks for the chance at this great giveaway! I've been hearing good things about Scarlet. The Indigo Spell and Scarlet but I have already read those...I would love House Rules too! I am looking forward to reading Beauty Awakened by Gena Showalter.